Ohio Wesleyan’s 2018 commencement will be held at 1 p.m. May 12 on Merrick Lawn, outside Merrick Hall. Here, the Class of 2017 celebrates its just-completed graduation ceremony. Ohio Wesleyan University’s graduating seniors will reflect upon and celebrate their OWU journeys May 11 during baccalaureate and then receive their diplomas May 12 at commencement. Baccalaureate will begin at 7 p.m. May 11 in Gray Chapel inside University Hall, 61 S. Sandusky St., Delaware. The event is planned by students with assistance from the university Chaplain’s Office. Baccalaureate typically features poetry and verse readings, personal reflections, and dance and music performances. Ohio Wesleyan’s Religious Life Awards also are presented at the annual event. The Class of 2018 Baccalaureate Committee has selected “Awakenings” as the theme for this year’s celebration. As part of the event, flags from each country represented by a 2018 graduate will displayed on stage. 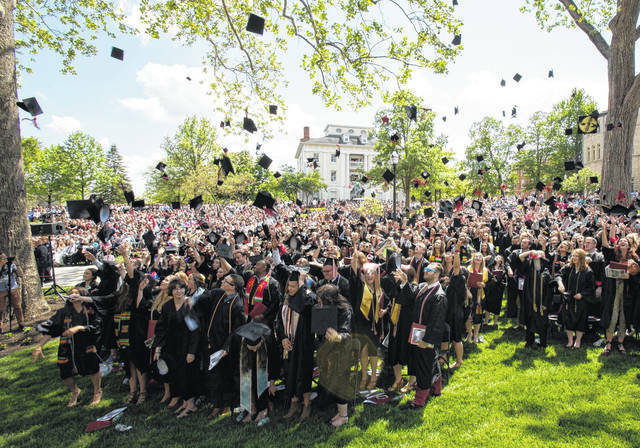 Following baccalaureate, more than 320 Ohio Wesleyan seniors are set to cross the stage May 12 to receive their diplomas, turn their tassels, and conclude their undergraduate careers. Ohio Wesleyan awards the Bachelor of Arts, Bachelor of Fine Arts, Bachelor of Music, and – new this year – the Bachelor of Science degree. The university’s 174th annual commencement ceremony will begin at 1 p.m. May 12 on Merrick Lawn, located outside Merrick Hall, 65 S. Sandusky St., Delaware. In case of severe weather, the ceremony will be moved into Gordon Field House, 105 S. Sandusky St., Delaware. If the ceremony is moved indoors, admission will be with ticket only. Genetic research and biotechnology industry leader Paul R. Schimmel, Ph.D., a 1962 Ohio Wesleyan graduate, will deliver the commencement keynote address. Schimmel’s groundbreaking research has helped to launch the human genome project, uncover a vast new area of biology, and support the development of new types of biopharmaceuticals to halt debilitating disease. A pre-professional medicine major at Ohio Wesleyan, Schimmel also holds doctorate in biophysical chemistry from the Massachusetts Institute of Technology. Since 1997, he has served as the Ernest and Jean Hahn Professor of Molecular Medicine and Chemistry and a member of the faculty of the Skaggs Institute for Chemical Biology at the Scripps Research Institute. Madeleine Juszynski, president of the Ohio Wesleyan Class of 2018, also will speak during the commencement celebration. Juszynski, of Atlanta, Georgia, is majoring in economics and minoring in accounting and Mandarin Chinese. This fall, she will enroll at Vanderbilt University Law School in Tennessee. Both Ohio Wesleyan’s baccalaureate and commencement ceremonies will be streamed live online at www.owu.edu/stream. Learn more about the events at www.owu.edu/commencement.